In the liner notes to No More Good Time in the World for Me, folklorist Nathan Salsburg makes a succinct observation: “African-American work songs are long-gone.” Indeed, as the social and labor conditions that provided context for this music—slavery, chain gangs, and share-cropping—have somewhat or fully disappeared, so have the work songs. Undoubtedly, these changes are welcomed progress. However, African-American work songs are important documents of cultural history, especially considering their influence on blues and other musical forms. This makes the recordings on No More Good Time in the World for Me—some of the last African-American work songs recorded in the United States—a vital historical document. 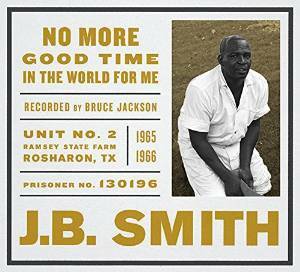 The album features eighteen songs performed by Johnnie B. Smith—also known as J.B.—while incarcerated at the Ramsey State Farm in Rosharon, Texas in 1965 and 1966. 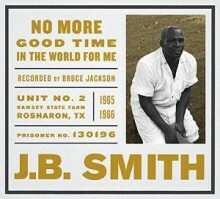 Folklorist Bruce Jackson recorded J.B. Smith at the prison, and would use this material for his 1972 book, Wake Up Dead Man: American Worksongs from Texas Prisons. Smith was in his mid-40s at the time of these recordings, serving his fourth prison term. He led work songs earlier in his life while serving on a chain gang and even composed work songs for himself while chopping sugarcane or picking cotton. These original compositions provide, arguably, the most interesting content of the collection. Often stretching twenty minutes in length, Smith’s own work songs are stark meditations on a variety of topics, including: being accused of crimes, the remaining time in his prison sentence, and a longing for freedom. The majority of Smith’s songs employ the same melody and ABBA form, the latter created by inverting the first and second lines for the third and fourth lines of each stanza. The result is a feeling of despondency: Smith uses music as a tool for escape, yet arrives back where he started again and again. “Sure Make a Man Feel Bad” (disc 2, song 1) gives the most accurate performance context of African-American work songs, as it is a group performance by Smith, Jesse “G.I.” Hendricks, Frank Young, and Houston Zachary. Smith sings the rest of the songs in this collection a capella. In the tradition of Dust-to-Digital’s previous releases, No More Good Time in the World for Me is beautifully packaged and thoughtfully produced. Bruce Jackson’s evocative photos, Nathan Salsburg’s erudite liner notes, and Michael Graves’ excellent mastering provide strong accompaniment and context for Smith’s work songs. No More Good Time in the World for Me is a timely reminder of why traditions are documented and an artistic portrait of J.B. Smith: a man searching for solace and awaiting freedom through song. This entry was posted in African American Culture & History and tagged J.B. Smith, No More Good Time in the World for Me by aaamc. Bookmark the permalink.